Grace's Guide is the leading source of historical information on industry and manufacturing in Britain. This web publication contains 132,952 pages of information and 210,197 images on early companies, their products and the people who designed and built them. 1901 June. Details of a new radiator by C. Binks, Aspley Engineering Co, Nottingham. Also a simple carburetter. 1903 Binks motorcycles were first produced, designed by Charles Binks of Nottingham. It had an advanced in-line, four-cylinder engine fitted into a diamond frame, to drive the rear wheel by an enclosed chain. It had strutted front-forks and a bucket seat, mounted on coil springs, for the rider. This was the world's first traverse-four motorcycle, a 385cc machine. 1904 A further model was offered. This was similar to its predecessor but with the engine mounted transversely. Both models had a clutch and were reputed to have outputs of up to 6hp. That year the in-line machine was sold as the 5hp Evart-Hall, and two other in-line machines were demonstrated at Coventry. 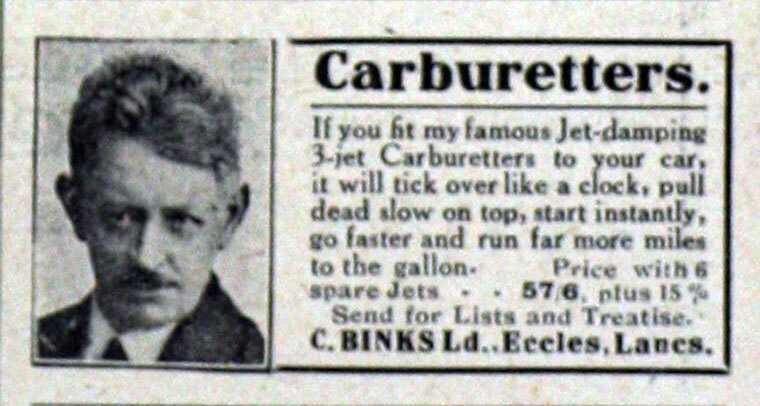 1905 Production costs were high, so Binks turned his attentions to the design of carburettors for which he later became famous. 1905 April. 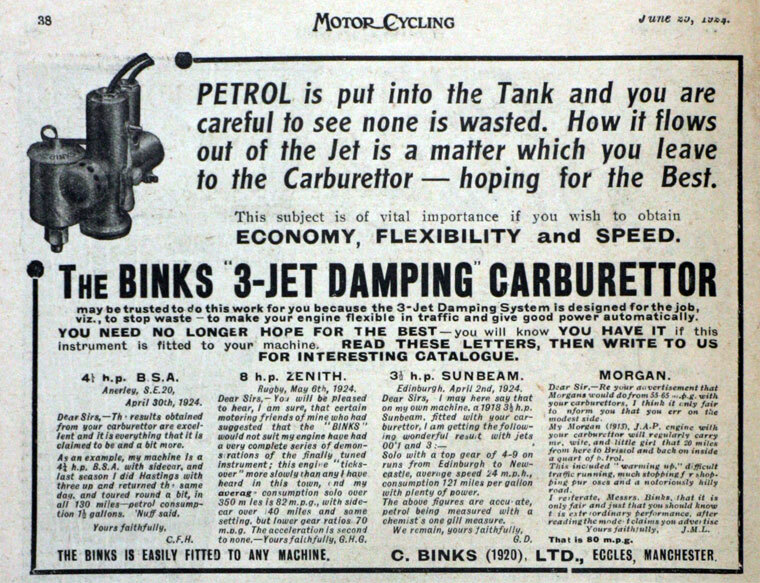 Details of the Binks carburetter. 1911 April. Details of the petrol-paraffin carburetter. 1913 October. Details of the two-jet Carburetter. 1914 June. Details of the petrol-paraffin carburetter. 1920 New company registered: C. Binks (1920) Ltd, to carry on the business of importing, exporting and manufacturing motors, etc. 1927 Public company formed: Amalgamated Carburetters Ltd to bring together 3 components manufacturers Brown and Barlow, Amac and C. Binks (1920) Ltd for better utilisation of their resources. This page was last edited on 3 April 2018, at 00:54.